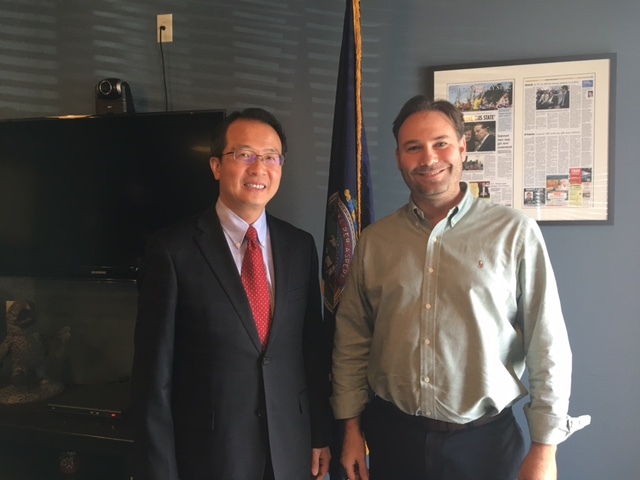 On February 2, Consul General Hong Lei visited Rep. Kevin Yoder’s office in Overland Park and met with office representative Ethan Patterson. Consul General Hong Lei elaborated on China’s cooperation with Kansas and China-US ties, highlighting that China’s fruitful cooperation with Kansas on trade, investment and people-to-people exchanges is full evidence of the mutually beneficial and win-win relationship between China and the US. Being the most important bilateral relationship in the world, China-US ties meet the interests of both countries and beyond. China’s development will continue to create huge opportunities for bilateral cooperation. It is hoped that Rep. Yoder can continue to support China-US relations and play a positive role in expanding all-round cooperation between China and the US. Patterson said that the sound China-US relations are in the interests of both people. Rep. Yoder is an advocate for international trade and believes that the US economy is dependent on the world. He welcomes Chinese companies’ investment in the US and win-win results.